"As a detector of geoneutrinos, KamLAND has distinct advantages," says Stuart Freedman of the U.S. Department of Energy's Lawrence Berkeley National Laboratory (Berkeley Lab), which is a major contributor to KamLAND. Freedman, a member of Berkeley Lab's Nuclear Science Division and a professor in the Department of Physics at the University of California at Berkeley, leads U.S. participation. 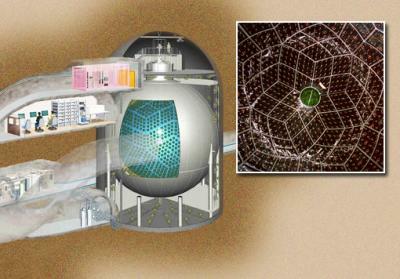 "KamLAND was specifically designed to study antineutrinos. We are able to discriminate them from background noise and detect them with very high sensitivity." KamLAND scientists have now published new figures for heat energy from radioactive decay in the journal Nature Geoscience. Based on the improved sensitivity of the KamLAND detector, plus several years' worth of additional data, the new estimate is not merely "consistent" with the predictions of accepted geophysical models but is precise enough to aid in refining those models. The first signal comes when the antineutrino converts the proton to a neutron plus a positron (an anti-electron), which quickly annihilates when it hits an ordinary electron – a process called inverse beta decay. The faint flash of light from the ionizing positron and the annihilation process is picked up by the more than 1,800 photomultiplier tubes within the KamLAND vessel. A couple of hundred millionths of a second later the neutron from the decay is captured by a proton in the hydrogen-rich fluid and emits a gamma ray, the second signal. This "delayed coincidence" allows antineutrino interactions to be distinguished from background events such as hits from cosmic rays penetrating the kilometer of rock that overlies the detector. Says Freedman, "It's like looking for a spy in a crowd of people on the street. You can't pick out one spy, but if there's a second spy following the first one around, the signal is still small but it's easy to spot." KamLAND was originally designed to detect antineutrinos from more than 50 reactors in Japan, some close and some far away, in order to study the phenomenon of neutrino oscillation. Reactors produce electron neutrinos, but as they travel they oscillate into muon neutrinos and tau neutrinos; the three "flavors" are associated with the electron and its heavier cousins. Being surrounded by nuclear reactors means KamLAND's background events from reactor antineutrinos must also be accounted for in identifying geoneutrino events. This is done by identifying the nuclear-plant antineutrinos by their characteristic energies and other factors, such as their varying rates of production versus the steady arrival of geoneutrinos. Reactor antineutrinos are calculated and subtracted from the total. What's left are the geoneutrinos. KamLAND's double-coincidence detection method is insensitive to the low-energy part of the geoneutrino signal from 238U and 232Th and completely insensitive to 40K antineutrinos. Other kinds of radioactive decay are also missed by the detector, but compared to uranium, thorium, and potassium are negligible contributors to Earth's heat. Additional factors that have to be taken into account include how the radioactive elements are distributed (whether uniformly or concentrated in a "sunken layer" at the core-mantle boundary), variations due to radioactive elements in the local geology (in KamLAND's case, less than 10 percent of the expected flux), antineutrinos from fission products, and how neutrinos oscillate as they travel through the crust and mantle. 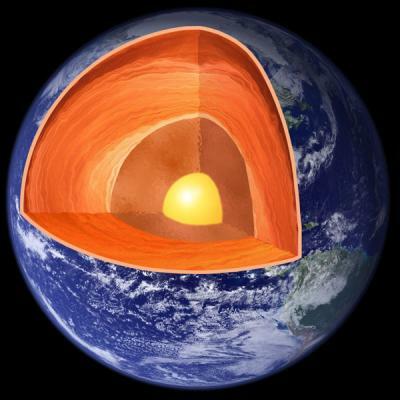 Alternate theories were also considered, including the speculative idea that there may be a natural nuclear reactor somewhere deep inside the Earth, where fissile elements have accumulated and initiated a sustained fission reaction. KamLAND detected 841 candidate antineutrino events between March of 2002 and November of 2009, of which about 730 were reactor events or other background. The rest, about 111, were from radioactive decays of uranium and thorium in the Earth. These results were combined with data from the Borexino experiment at Gran Sasso in Italy to calculate the contribution of uranium and thorium to Earth's heat production. The answer was about 20 terawatts; based on models, another three terawatts were estimated to come from other isotope decays. This is more heat energy than the most popular BSE model suggests, but still far less than Earth's total. Says Freedman, "One thing we can say with near certainty is that radioactive decay alone is not enough to account for Earth's heat energy. Whether the rest is primordial heat or comes from some other source is an unanswered question." Says Freedman, "This is what's called an inverse problem, where you have a lot of information but also a lot of complicated inputs and variables. Sorting those out to arrive at the best explanation among many requires multiple sources of data."